Angie Quaale has been in food and hospitality for all of her working life. After several years in hotels and fine dining, Angie moved into a career in commercial food sales, specializing in menu development and retail food distribution. 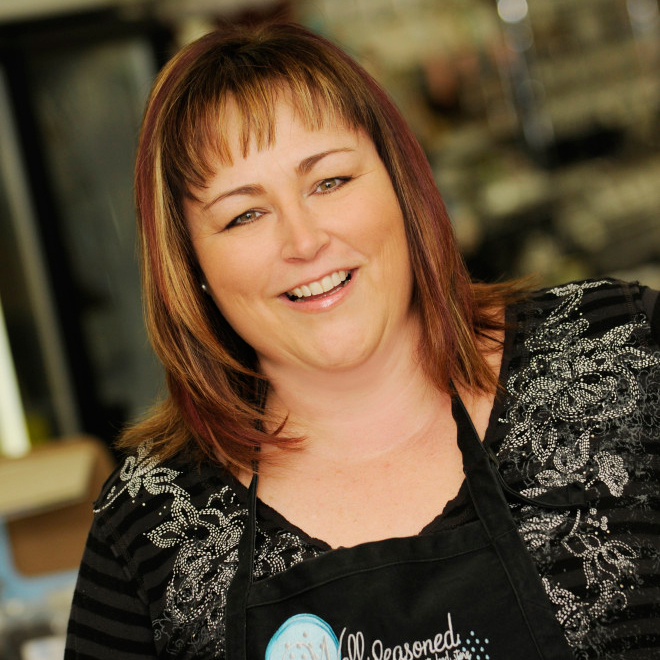 The need for a gourmet shop in the Fraser Valley encouraged Angie to open Well Seasoned in 2004 and now it carries thousands of products from around the world and most importantly from right here in our backyard. I created my first version of this recipe years ago for my dad, a true lover of chocolate—it is simple and super-rewarding. You can use your favourite plain or flavoured truffle in the centre. At ChocolaTas, they make a truffle with almond praline paste that is outstanding in this dessert. Generously butter six ovenproof 6 oz (¾ cup) ramekins and dust each well with cocoa powder. Place the prepared ramekins on a rimmed baking pan and prepare the filling. In a small bowl over a small saucepan of simmering water (or in a double boiler), melt together the chocolate, whipping cream, and the 3 tbsp butter, stirring to combine and to ensure your chocolate doesn’t burn. When the mixture is smooth, set aside to cool for about 10 minutes at room temperature. In a large bowl, place the eggs, sugar, vanilla and salt. With an electric mixer on medium-high speed, beat until the mixture triples in volume and is very thick, about 5 minutes. Sift the flour over the egg mixture and, with a rubber spatula, fold the flour into the mixture. Then fold in the cooled chocolate/butter mixture and continue to fold until it is well-mixed. Drop one chocolate truffle into the center of each filled ramekin, pressing gently to submerge it in the batter. If it doesn’t fully submerge, that’s OK—it will sink as it bakes. Transfer the baking pan with the filled ramekins to the oven and bake for 9 to 10 minutes, just until the tops are set. Remove from the oven and let the cakes cool in the ramekins on a wire rack for about 5 minutes. Run a sharp knife around the edge of each cake between the cake and the ramekin to loosen it and turn out onto individual serving Or, if you’re nervous about doing that, feel free to leave them in the ramekins; they are going to taste just as delicious. (Removing them from the ramekins just makes them a bit fancier.) Serve immediately with lightly sweetened whipped cream or vanilla ice cream. 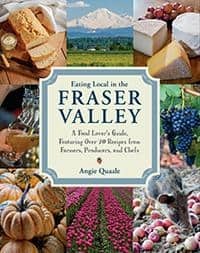 Excerpted from Eating Local in the Fraser Valley by Angie Quaale. Copyright © 2018 Angie Quaale. Published by Appetite by Random House®, a division of Penguin Random House Canada Limited. Reproduced by arrangement with the Publisher. All rights reserved.